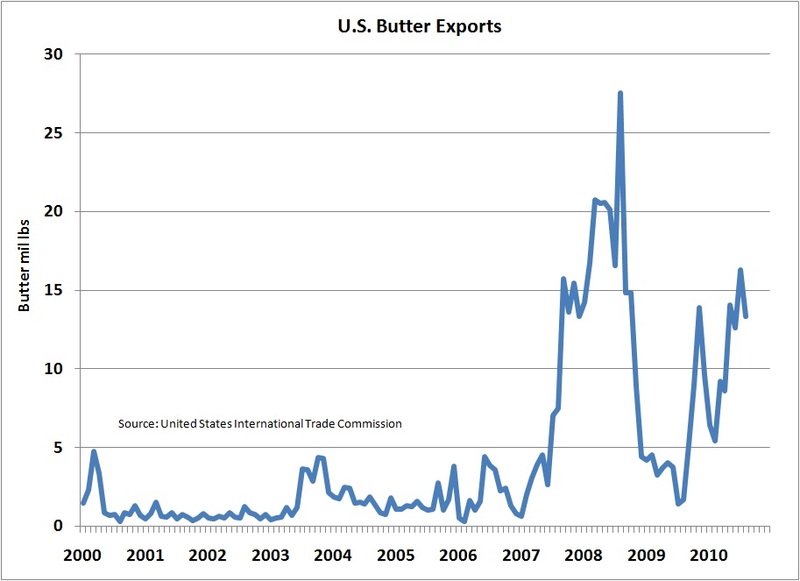 The October Class III milk and component prices were announced November 5. October was an amazing month with every single parameter up over the previous month. 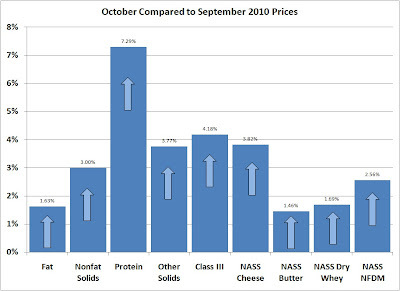 Protein leads the list of increases, up over 7%, which also gave the Class III price a very nice boost, up over 4%, to $16.94/cwt. 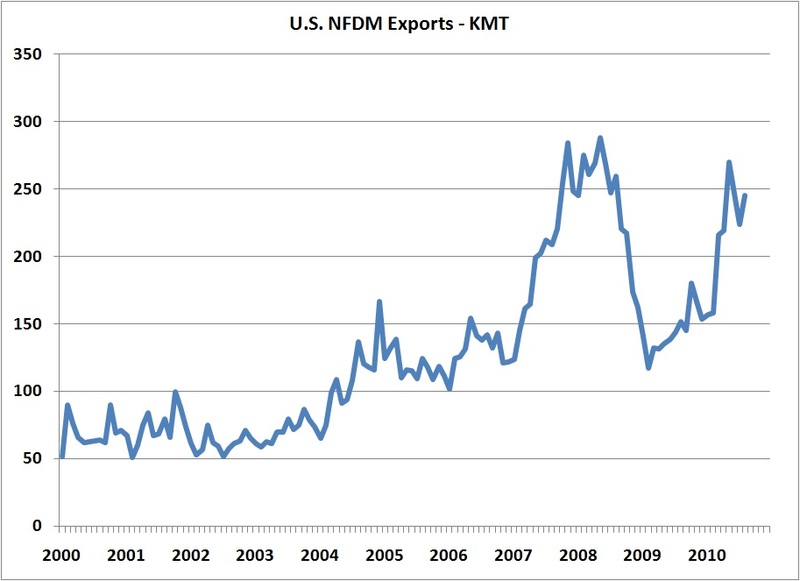 We can also be very proud of the increases in export volumes in 2010. 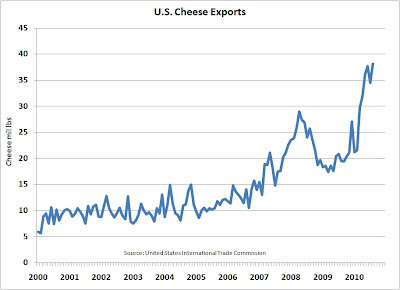 Exports of cheese, NFDM, and butter are all up significantly. 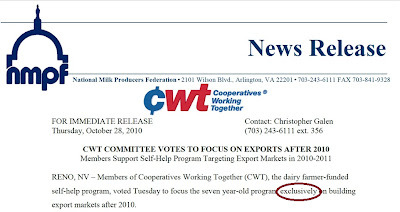 The CWT program announced a major policy shift in October stating their plans to drop their expenditures for herd retirements and concentrate wholly on efforts to increase dairy product exports. 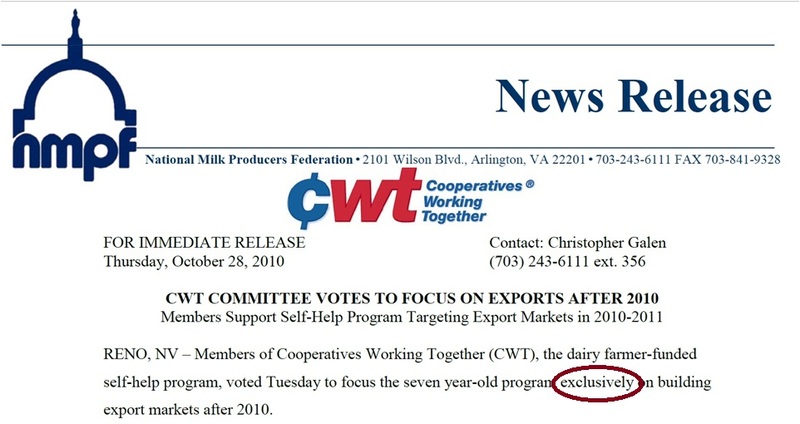 There are significant funds in the CWT program, so this change which is slated to start in 2011 could be very impactful. The press release can be read in its entirety at this link. 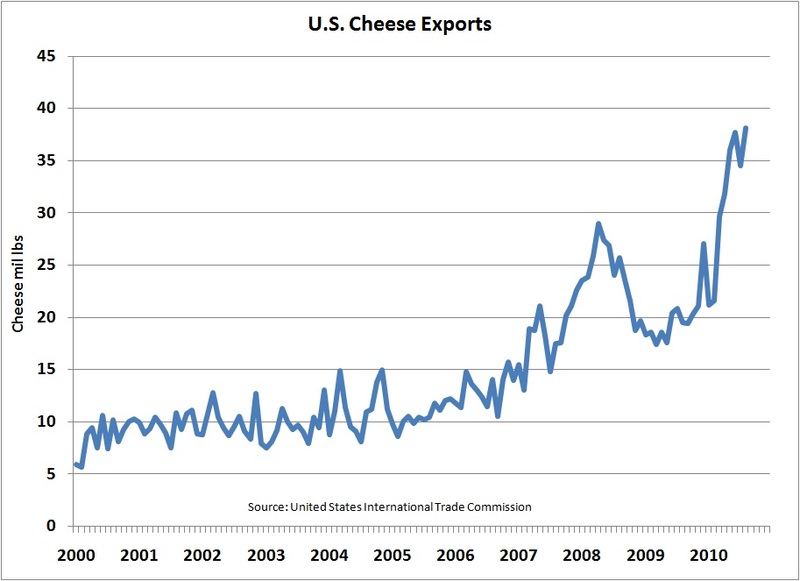 This is a very important change in policy. 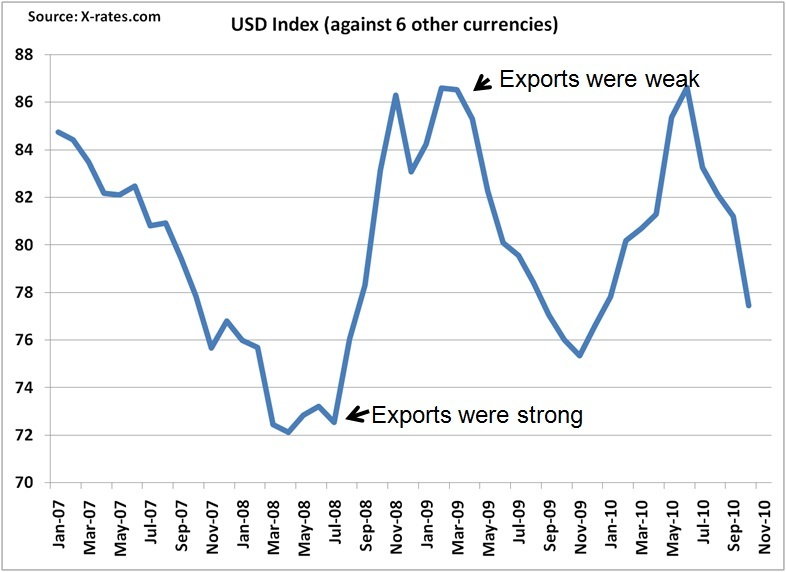 A weak dollar is also a very important factor in expanding exports and reducing imports. 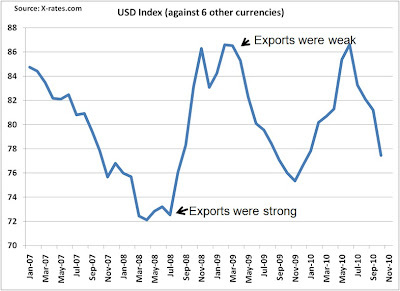 The USD has significantly softened against other currencies and with the new Fed efforts aimed at "Quantitative Easing", continued further weakness in the USD is likely. 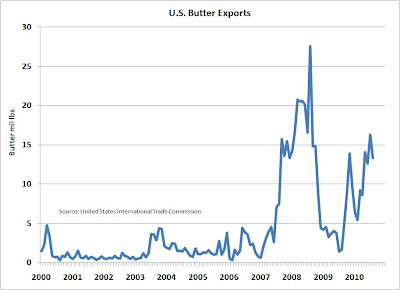 So much for all the good news. 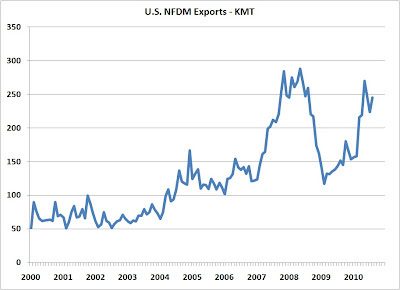 October prices were great and current and future efforts for expanding exports look extremely positive, but, we are still in an unusual period in terms of inventories. 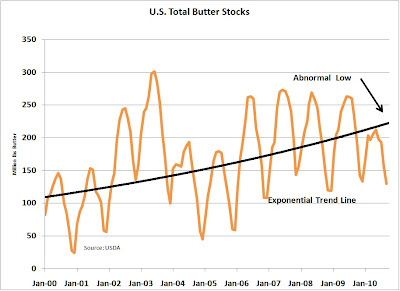 Cheese stocks remain very high and butter stocks remain very low. 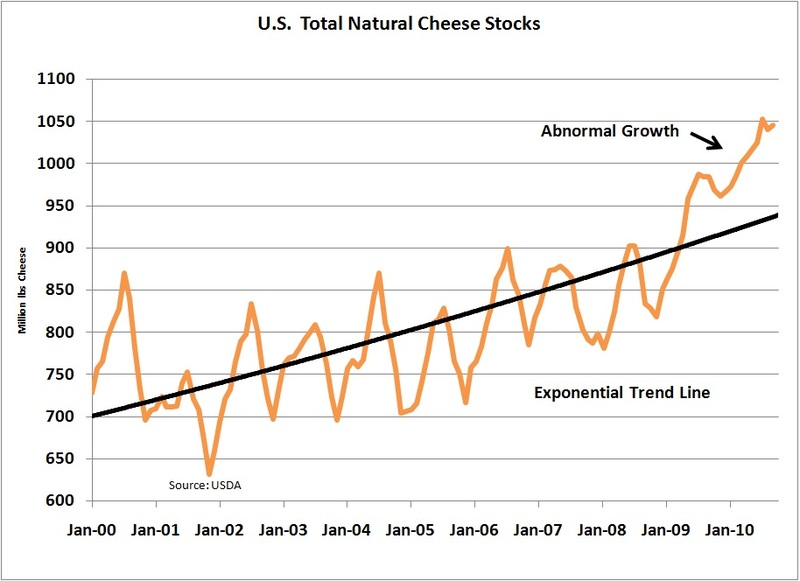 Cheese stocks and their impact on cheese pricing and Class III milk prices (see the relationship explained in the April 7, 2009 post to this blog) is supply and demand driven, such that high stocks result is lower prices. 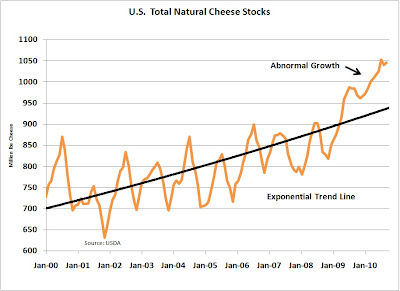 Cheese prices have already started to drop on the CME, and the NASS cheese prices will undoubtedly follow this downward trend until the surplus cheese stocks are dealt with. This will have a short term detrimental impact on November milk protein and Class III prices.